The Duplo UJ-500AS Anti-Static Air Paper Jogger is the essential tool for printing and post-printing finishes. The heavy-duty air blower prevent uneven stacks before printing and also avoid paper from becoming marked as air is blown in between the sheets. The great benefit of the UJ-500AS is increase the efficiency of feeding while decrease the feed errors like miss and double feed. This air jogger provides numerous flexible job functions such as air only, jogger only, reset timer operation, and time interval difference mode. The UJ-500AS Anti-Static Air Paper Jogger is an ideal machine for post-printing finish as it will ensure the ink is dry and even reduce electric and powder static from rubbing off the documents. No more wasted print materials with the Duplo UJ-500AS Anti-Static Air Paper Jogger, see how you can save today. Dimensions: 14.2" x 15.3" x 41"
The UJ-500AS Air Jogger is the perfect companion for printing and post-printing equipment. The unique vibration system allows for paper jogging and edge aligning which dramatically improves paper feed. The jogging tray on the UJ-500AS can easily be adjusted for proper positioning. The jogger’s control panel offers flexible options. Depending on paper weight and static, the air strength can be adjusted from weak to strong. The timer can also be activated, letting you know when a job is complete. Simply set the paper on the tray to load. 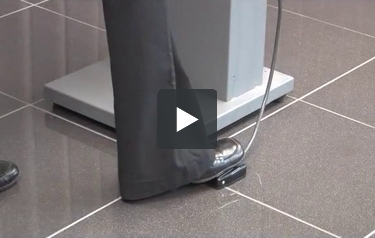 The jogger can be activated hands-free using the provided foot pedal. Prior to loading into a printer or collator, jogging the paper stack with the UJ-500As can noticeably improve paper feed errors, such as mis- and double-feed. The ionized air blowing mechanism is also effective in reducing post-printing problems, such as static electricity and powder rubbing off paper. Printing and binding companies utilizing large or small facilities can expect easy portability and a small footprint from the UJ-500AS. For more information, please contact a Duplo specialist. Do you have a smaller tray for the Duplo UJ-500AS ? We are using material 3" X 9"
Unfortunately we don't have anything to make this smaller, but they do have trays for larger materials. We do have other joggers that are not air assist that come with smaller trays but this specific model does not come with a smaller option. If you are looking to order a machine or need something different, please feel free to call us at 800-944-4573.